The main storyline of Sailor Moon focuses on the main character, Sailor Moon, and her Inner Sailor Warriors, namely Sailor Mercury, Sailor Venus, Sailor Mars, and Sailor Jupiter. But they are not the only sailor soldiers in the series, as there are other Sailor Warriors. One of them is Sailor Neptune. 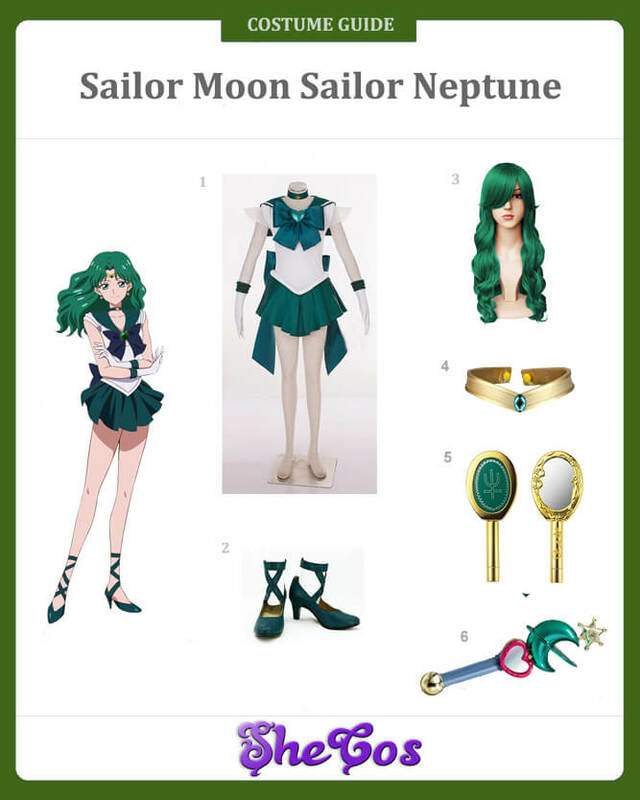 This article will be a Sailor Neptune cosplay guide. Sailor Neptune is one of the Soldiers of the Outer Solar System, who are tasked to protect the solar system from external threats. Her civilian identity is Michiru Kaioh, who is a teenage schoolgirl in Japan. Out of all the sailor soldiers in the series, Michiru’s personality and characteristics are the ideal examples of what a princess is. 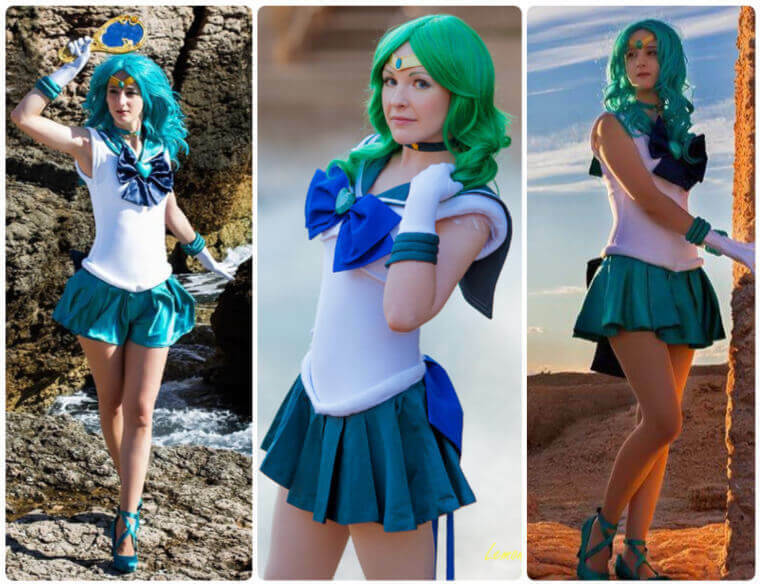 It makes Sailor Neptune an ideal choice for ladies who want to cosplay a princess-like character in Sailor Moon. 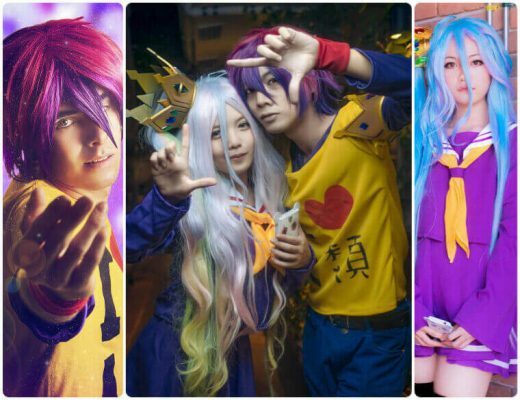 And like the other sailor soldiers, dressing up as this character is simple to do. Sailor Neptune is a character in the third story arc of the Sailor Moon series. Her powers come from the sea and precognitive ones. She also possesses a magic mirror that also grants her certain powers. She is also the character in the Sailor Moon series that is mostly associated with sophistication and art. The Sailor Neptune cosplay set will include the full costume and accessories. The entire costume includes her sleeveless white sailor school uniform with teal collars, a teal choker, and a teal mini skirt. The dress also comes with a teal bow at the front and the back of the mini skirt and mid-forearm-length white gloves with teal colored bands at the forearm. The costume includes the teal-colored shoes with heels, a teal-colored long wig for Sailor Neptune’s hairstyle, a headband headwear, a mirror prop and a magical wand. Sailor Neptune is also known as the Soldier of the Sea, Soldier of Comprehension, and Soldier of Embrace. The character is a sophisticated and elegant character that is capable of being cold and angry. She is a character that fights alongside Sailor Uranus, who is also her lover. Despite having the characteristics of an ideal princess, Sailor Neptune is very dedicated to her role and duty as a Soldier of the Outer Solar System. Her precognitive ability allows her to predict who the next target of the Death Busters will be. Sailor Neptune is profoundly artistic, and her aura of sophistication will usually manifest itself in art and music. But you can also see in her appearance how sophisticated and princess-like this character is. 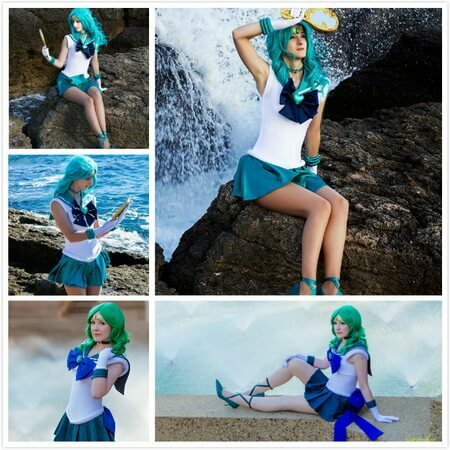 Looking at the Sailor Neptune cosplay photos, you can see her sophistication in the way she dresses. It can even be shown further if you dress up like Sailor Neptune and have her magic mirror as a prop.